(click image for large view) The Chieftain MBT was designed as a conventional layout tank maximizing its’ attributes of firepower and armour protection. Development began in the late 1950s with the first production vehicles being manufactured by Royal Ordnance Factory, Leeds, in the early 1970s. The vehicle is similar in appearance to many of todays MBTs. Notes For Collectors: I think the specifications give you a good idea about this one. This vehicle is only for the bravest of armour collectors. To transport it requires specialized equipment. It is over width and over weight in any state. To maintain it requires heavy material handling equipment. Nothing on it is lightweight. To operate it you need some property you don’t mind leaving a few track marks on. But on the upside you have to realize that you are buying a main battle tank. Few individuals in the world can say they own one. It is a very, very impressive vehicle. Parts are still available. Assistance with maintenance can be arranged when needed. 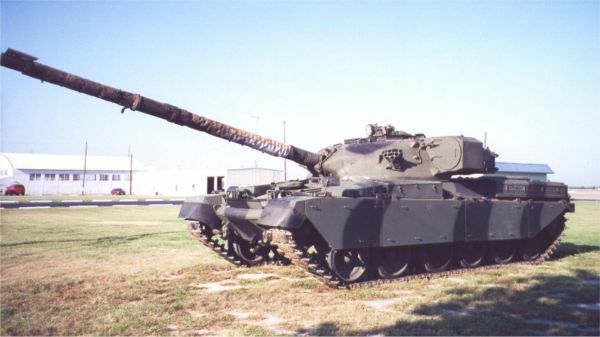 The Chieftain is about as modern of a MBT that an individual collector can afford to buy.